A labyrinth of charming canals, technicolor tulips dancing in the early spring breeze, Van Gogh’s interpretation of Gauguin’s chair and the brooding Dutch masters with their infinite shades of black are all worthy of celebration and contemplation in Amsterdam. 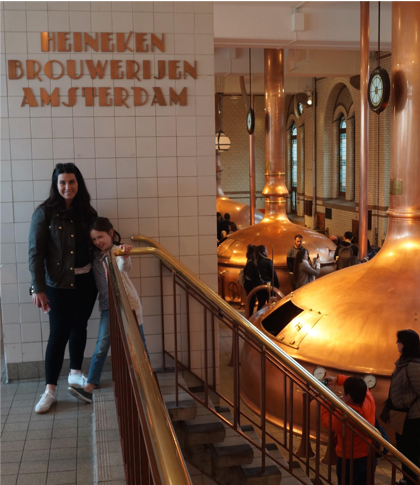 But the brand storyteller and beer lover in me could not resist a visit to the “Heineken Experience” on a recent visit to this amazing city with my young family. 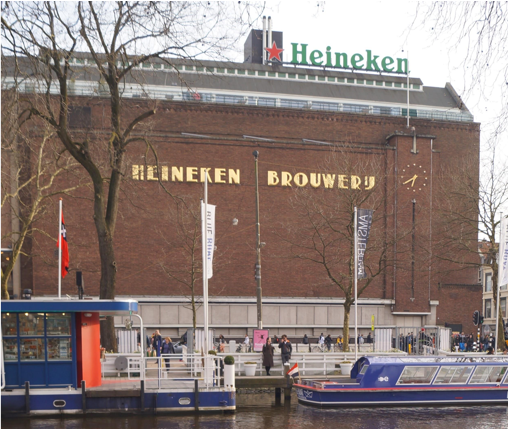 To meet the growing demand for their Dutch Pilsner in 1867 Heineken built a state of the art brewery on the banks of one of the outer canals that radiate through Amsterdam. In 1988 a new facility was built outside of the city to meet the now soaring international demand. In 1991 the old brewery with it’s monolithic brickwork and as large as a city block was opened to the public as an interactive brand immersion, truly a masterclass in 360 degree brand storytelling. With pre purchased tickets we happily jumped the football field long line to pick up our silicone bracelet passes with two free beer tokens attached. The line was celebratory nonetheless with brand devotees eagerly holding up Instagram ready photo frames happily delivered by jocular employees sporting green suits and ties. This enthusiasm and authentic sense of fun was pervasive throughout our 90 minutes inside. 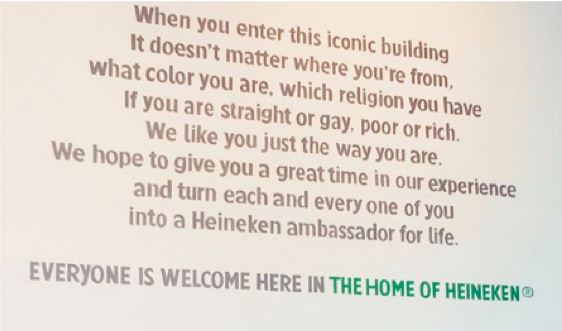 While the whole experience could have easily careered into a ditch of commercialism, I have to say Heineken did a superb job and instead of a marketing mallet used psychology, subtlety and quality like bubbles in the beer to gently turn us from tourists into ambassadors. Like the five points on the red star on the label of a Heineken the 5 senses of touch, taste, sight, smell and hearing were employed to give us a truly unique and memorable experience. Like a three act play the experience was laid out before us. The tour begins under a 5 story grain silo, and ends at a humming bar with everyone sampling the coldest Heineken imaginable. The cool, dark and clean first floor was a welcome respite from the chaos of the buzzing street. A smart, bespectacled woman in her 20’s welcomes our group with an energetic introduction to the tour and the brand. While Jagermeister and Bud tend to cast Hooters type party girls, the Heineken guides had more of a university educated vibe, an understated hipness, friendly but not too friendly where it is fake. Although lost on my 10, 8, and 5 year olds I was taken by the origin story of a 22 year old Gerard Heineken in 1864 borrowing money from his mother to purchase the Haystack brewery. Costumed hologram reenactors make the history come to life and give off an original hipster vibe with their mutton chops and glint of optimism in their eye. Although that moment was 150 years ago, we believe Gerard was just one of us, with a passion and a dream. The tour was self-guided and 5-minute presentations were delivered every 10 minutes throughout the exhibitions. A brewing lesson on the roles of hops, barley, water and Heinekens flavor defining yeast was delivered. We could stick our hands in the barley, smell the hops, and stir and taste the pre-alcohol sludge called wort. In a vast room that oozes history and has the feel of a Wes Anderson film, we ducked our heads into gigantic copper vats where Heineken was brewed for over 120 years. We met the huge black and white Shire horses that used to power the facility, and deliver the beer. #HeinekenExperience photo ops are peppered through the rest of the tour, with pose worthy sayings of “We say proost!”, “Cheers”, “Good isn’t good enough, it has to be perfect” and walls made of luminescent green bottles lit from behind. Like lemmings, people would wait in line to capture the Insta-worthy moment. A surrealist beer simulator takes 100 guests at a time into a big room with walls and ceilings made of led screens. The metal plates on the floor would rumble while we experience what it is like to be brewed and bottled. In the end, we are poured into smaller rooms where a steady stream of suggestive on brand scenes batter our reptilian minds into submission. Clever green screen scenes allow you to email a video of yourself, friends or family in a Dutch bicycle, delivering Heineken through busy Amsterdam streets. With our crew growing restless we breezed through the museum of Heineken F1 and Rugby sponsorship where the kids kicked virtual rugby balls into a goal and continued onwards towards the denouement. The tile lined basement that once housed huge fermentation tanks, is now a neon-lit thumping bar where my wife and I over 200 other brand devotes could sample the coldest and freshest Heineken on the planet and the kids could get a soda. The beer was handed to you with a smile and served a big foam head that was trimmed with a skimming knife. The experience fermented within us as the beer was to be tilted in a way to dive under the suds while grabbing a big gulp of this historic golden brew.